For any animal under anesthesia for longer than 20 minutes, techniques to minimize heat loss should be applied.1 This is because detrimental effects, such as a decreased ability to recover and an increased incidence of infection, can occur in instances of severe hypothermia, and in the critical patient this could lead to death. Also hypothermia may persist into recovery and affect recovery quality and duration. Core temperature changes occur in 3 phases during anesthesia. In the first hour, an initial rapid decline results from peripheral vasodilation and redistribution of body heat. Over the following 2 hours, the temperature declines in a slower linear fashion because of the inhibition of metabolism and heat production by the anesthetic drugs. Finally, over the next 3 to 4 hours, core temperature stabilizes and remains relatively unchanged as thermal steady state is achieved. Body temperature changes in a predictable manner as a result of the core-to-peripheral temperature gradient.4,5 The gradient is maintained mainly via peripheral vasoconstriction, which keeps the body heat in a central pool of blood and minimizes the heat that can be lost through the skin.4 The extremities will be cooler because of shunting of blood to the core.1 The size of the animal plays a role in heat loss. A larger body surface area increases these losses through cutaneous loss. That means that small- and toy-breed dogs have a greater risk for heat loss than large-breed dogs because of their higher surface area. A 1-kg Yorkshire terrier is undergoing general anesthesia for enterotomy to remove an intestinal foreign body. This 2-year-old spayed female ate a hair tie yesterday and has been vomiting since then. On physical exam, she is bright and lively, with a heart rate of 130 beats/min, respiratory rate of 20 breaths/min, normal heart and lung sounds, and body temperature of 38.4˚C (101.2˚F). Abdominal radiographs and ultrasounds show an obstruction due to a foreign body lodged in the duodenum, requiring a surgical exploratory laparotomy. The dog is anesthetized with hydromorphone, 0.1 mg/kg, and midazolam, 0.25 mg/kg IM. Induction is done with propofol, 4 mg/kg IV titrated to effect, and then intubation. The dog is placed on a nonrebreathing circuit with oxygen and isoflurane at a flow rate of 2 L/min. During the procedure, the anesthetist monitoring the dog notes the body temperature, taken via an esophageal probe, is 31.6˚C (89˚F). In our case study, an enterotomy is performed, with successful removal of the hair tie. Before closure, warm saline lavage is instilled into the abdomen, allowed to sit, and then removed via suction; this is done twice. In recovery, the rectal temperature is 32.7˚C (91˚F), a slight improvement over the 31.6˚C (89˚F) body temperature during surgery. This improvement is due to the warm lavage used to rinse the abdomen both before and during the closing of the abdomen. The dog is wrapped in a forced warm air heating blanket with an infant radiant heater positioned over the dog. The dog is kept lightly anesthetized until the body temperature is 35˚C (95˚F) to prevent severe shivering and the associated stress of shivering. When the dog’s temperature reaches 35˚C (95˚F), the inhalant is discontinued. Oxygen is used until the temperature reaches 36˚C (97˚F); then the dog is placed on room air. Blood glucose measurement is within normal limits, and the pulse oximeter is monitored until the dog no longer tolerates the probe on the tongue. The dog is extubated when she begins chewing and swallowing. The body temperature is 36.7˚C (98˚F), and the radiant heater is removed. The dog is then placed in a recovery cage with a forced warm air blanket. When the dog’s temperature reaches 37.2˚C (99˚F), the forced air blanket is removed and the dog is covered with a towel. The towel is removed when the temperature is 37.8˚C (100˚F). In this case, the dog has an uneventful recovery. Patients should be rewarmed quickly but carefully. The recommended rate of rewarming to increase core body temperature is 1.1°C to 2.2°C (about 2°F to 4°F) per hour.3 Rewarming can be by passive surface warming, active surface warming, active core warming, or a combination of techniques. Active warming applies heat to the patient to reduce the gradient between the body and the environmental temperature. This method is recommended for all levels of hypothermia. Active warming with a forced hot air warmer, a water-circulating blanket, towels or blankets around the patient, or socks placed on the paws will help provide external heat to the animal and prevent further heat loss.6 Maintain the body temperature as near to normal as possible. The use of forced warm air blankets seems to be the most efficacious active warming method for thermal management in dogs and cats. These blankets can be placed over or under the patient, with air flow directed toward the patient. Note that infection has been associated with the use of forced warm air blankets placed too near the surgical field and the blowing of particles into the field. This can be prevented with proper blanket placement and isolation of the surgical field.1 The forced air should not be turned on until the surgical drapes have been positioned and clamped into place. Active surface warming can also involve a heating pad, heating lamps, or dryers to offset the animal’s inability to generate heat. Heating pads and lamps must be used carefully to avoid patient burns, and lamps should be used from a distance of more than 30 inches.7 A patient should not be left unattended when a heat lamp is used; instead, use of an overhead hospital infant radiant heat warmer is recommended. Be especially careful with active surface warming of cats. Provide IV fluid support and use warm fluids to avoid further heat loss, maintain normotension, and prevent shock. The temperature of warm IV fluids should not be higher than 42.6°C (108°F) to avoid cellular injury.3 Apply heat to the trunk, thorax, and abdomen, but not the extremities (to avoid peripheral vasodilation and persistent hypothermia). 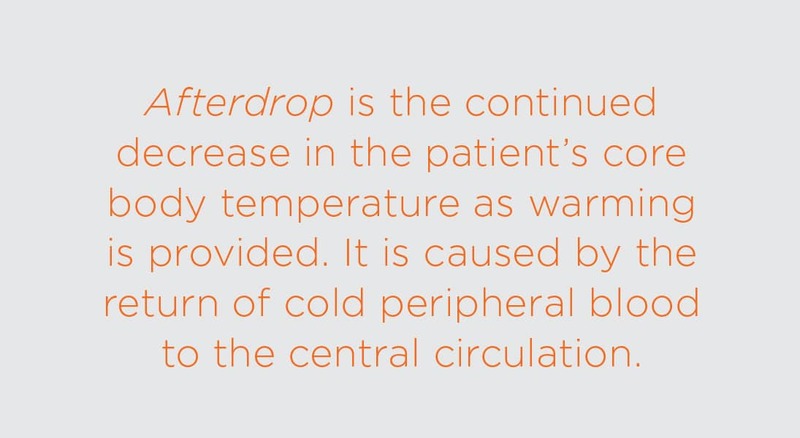 Careful warming and close monitoring are essential in managing the hypothermic patient to avoid “afterdrop” or “rewarming shock.” Afterdrop is the continued decrease in the patient’s core body temperature as warming is provided. It is caused by the return of cold peripheral blood to the central circulation. To help prevent this, remember to warm the trunk, chest, and abdomen, but not the extremities. Because an animal recovering from anesthesia may experience hypothermia, it must be treated appropriately to improve patient recovery and decrease potential morbidity. Several complications can occur with hypothermia. For example, impaired cardiovascular function may develop, with decreased cardiac output that leads to vasoconstriction. When the animal is rewarmed, vasodilation can enhance hypovolemia and lead to shock. Cardiac arrhythmias can occur at body temperatures of 31°C (87.8°F) or less. Hypothermia can cause hypoventilation, necessitating ventilator support, and liver metabolism and renal excretion of anesthetic drugs are slower because of the decrease in liver and renal blood flow. This may prolong recovery and lead to weakness in recovery. Animals with hypothermia may also have decreased resistance to infection and increased incidence of surgical wound infection. Other complications include decreased oxidative killing by neutrophils, reduction of phagocytosis, and suppression of leukocyte migration. The vasoconstriction and increased blood viscosity decrease oxygen delivery to tissues, contributing to poor wound healing. The increased blood viscosity and slowing of enzymatic reactions of the coagulation pathways can lead to coagulopathy and increased blood loss. There is also increased postoperative protein catabolism. Shivering increases metabolism and heat production, but also increases myocardial oxygen demands and glucose needs.3,5 These adverse effects can be minimized with appropriate thermal support for the anesthetized patient. Radiation and convection are the most important causes of heat loss and can account for 80% of the total heat losses in patients. 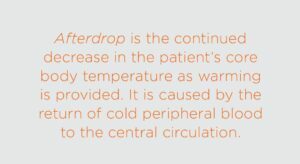 Keeping the air temperature around the patientwarm will decrease heat loss. Clark-Price S. Inadvertent perianesthetic hypothermia in small animal patients. Vet Clin North Am Small Anim 2015;45(5):983-994. Todd JM. Hypothermia. In: Silverstein DC, Hopper K (eds). Small Animal Critical Care Medicine. 2nd ed. St. Louis: Elsevier Saunders; 2015:789-795. Lagutchik MS, Ford A. Care of the environmentally injured animal. In: Burkitt-Creedon JM, Davis H (eds). Advanced Monitoring and Procedures for Small Animal Emergency and Critical Care. Ames, IA: Wiley-Blackwell; 2012:799-813. Ko JC. Anesthesia monitoring and management. In: Ko JC (ed). Small Animal Anesthesia and Pain Management. London: Manson Publishing; 2013:123-162. Posner LP. Troubleshooting hypothermia and hyperthermia. In: Smith LJ (ed). Questions and Answers in Small Animal Anesthesia. Ames, IA: Wiley Blackwell; 2016:147-153. Hackett TB. Physical examination and daily assessment of the critical ill patient. In: Silverstein DC, Hopper K (eds): Small Animal Critical Care Medicine. 2nd ed. St. Louis, MO: Elsevier Saunders; 2015:6-10. Clarke KW, Trim CM, Hall LW. Anesthesia of the dog. In: Clarke KW, Trim CM, Hall LW (eds). Veterinary Anesthesia. 11th ed. St Louis, MO: Elsevier Saunders; 2014:405-498. Ko JC. Anesthetic emergencies and cardiopulmonary resuscitation. In: Ko JC (ed). Small Animal Anesthesia and Pain Management. London: Manson Publishing; 2013:173-186. Jane is associate professor of comparative anesthesia at the University of Georgia College of Veterinary Medicine. She received her DVM from Iowa State University and her master’s degree in anesthesia from the University of Minnesota. She has diplomate status with the American College of Veterinary Anesthesia and Analgesia and American College of Veterinary Emergency and Critical Care.